On the third Sunday of Great Lent, we concentrate on the Cross of Christ, and Fr. Tom helps us understand what it means to take up our cross. Fr. 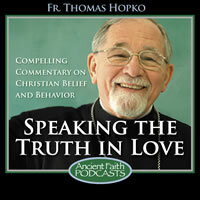 Tom continues his discussion, this time focusing on the Divine Attributes of God. Fr. Thomas concludes his series by reflecting on what it means to be a Christian in America today.